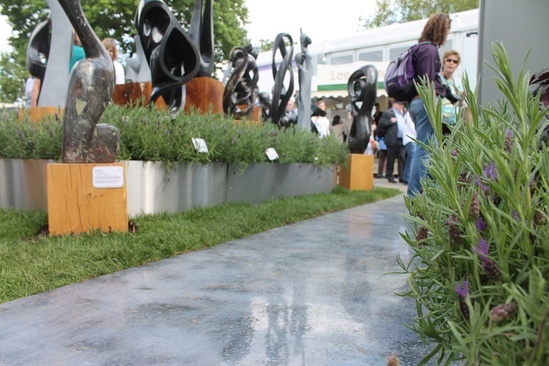 Addagrip supplied Addazing bespoke designer resin floor surfacing for a pathway on the Guruve stand at the 2016 RHS Chelsea Flower Show, held in the grounds of the Royal Hospital Chelsea, London. 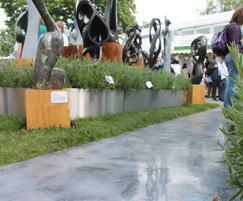 Guruve, specialists in authentic contemporary African art and sculpture, wanted to incorporate a bespoke pathway into their stand design which would be in keeping with the unique artwork on display. 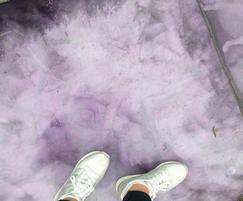 Addazing was chosen to help create an eye-catching effect and two tonal pigment was used to produce a pathway that would change colour depending on how light reflected on the surface. Changing from a pale green to purple hue, the unusual colour shifting surface reflected the mystique of the sculptures on display at the Guruve stand. For the purpose of the exhibition, white aluminium oxide grit was added to the Addazing surface to aid slip resistance for the thousands of visitors to the show. Addazing is suitable for bespoke internal flooring projects to create surfacing that is a work of art. Incorporating metallic and/or pearlescent pigments, each floor, each mix and every finish is individual.